Even ancient archaeological sites such as the Acropolis in Greece are being disfigured by graffiti. Greece is being overwhelmed by the rising tide of graffiti. 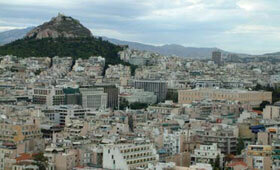 Do Athenians not realise that they are destroying their heritage and deterring tourism? Or are they too ignorant to care? Some of the disfigurement of ancient archaeological sites and monuments is a tragedy. Some will remain marred beyond repair. The buildings of the Parthenon and Acropolis in Greece are marble, easily stained and difficult to clean. Ancient Greek sites are one of the main reasons why tourists visit. Greece is a relatively poor European country that relies heavily on tourism and its people are destroying it. When visitors stop coming to Greece because of its defaced and ruined temples and income from tourism falls even further, what will the Greeks have to offer? Sunshine is not enough, there are lots of other cheaper countries to visit for sunshine. There is a saying that the Greek people should take to heart before it is too late: 'do not crap in your own backyard'. No matter which country you consider, you will find examples of graffiti. Certain countries such as Singapore are tough on graffiti vandalism and still cane people who carry it out, even if they are foreign visitors. Singapore because of its strict laws is known to be a pleasant and safe place to live, relatively free of crime. Their strict rules and enforcement have made Singapore a better place for everyone. Graffiti is becoming popular in China. People of all ages have begun to practise their lettering and images. Strange really, because China is not known for its tolerance. There are currently no laws restricting the use of graffiti in China partly because this is a relatively new occurrence, and most of the graffiti is about fashion and style and not political statements that the Chinese government objects to. The Chinese people see it as self-expression or a new form of art. Graffiti in Australia. See graffiti or street art in Newtown, Australia. Although Australia is anti-graffiti, it has experimented with public graffiti walls in an attempt to provide an outlet for graffiti and safeguard other buildings. Worldwide experience shows that this policy does not prevent graffiti elsewhere and may indeed encourage it through suggestion. Graffiti in Poland spoils otherwise beautiful old town centres - see graffiti in Wroclaw, Poland. Countries like Poland do not necessarily have the resources to deal wit the problem. Much more public education is required for people to get together and commit to keeping their home town beautiful. Generally, councils and anti-graffiti policies have managed to keep Britain's streets relatively graffiti free and clean up quickly after any graffiti appears. It remains to be seen whether standards are maintained because of budget cuts and in the view of rising unemployment and civil unrest after 2010. Compare the laws and penalties concerning graffiti in Great Britain, the USA, India, Singapore and Russia and your own country.